I felt blessed to be out running today. 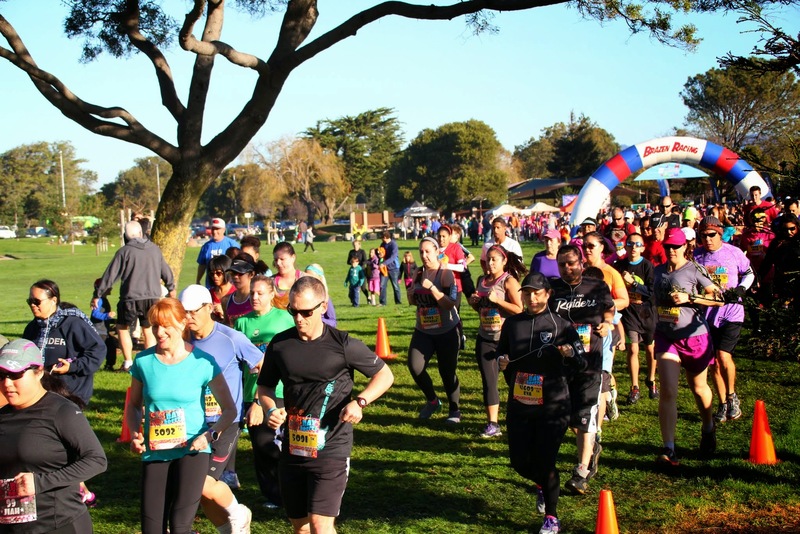 It must have been 60 degrees at race time, with a light breeze, and on its way to a low 70s day in the Bay Area. I feel doubly-blessed to be running with my family and for a great cause: the GBS/CIDP Foundation. As always, I encourage you to like my Facebook page athttp://facebook.com/fiftytwofives, and donate over at IndieGoGo. After yesterday’s crazy time of 20:15 for a 5k, I took it a whole lot easier today. My left calf has a knot in it, my quads were tight, and I had to take a few deep breaths as I warmed up with a yoga-inspired downward dog. I probably should have stretched, rolled, and drank less champagne last night — you’d think I’d have learnt by now. 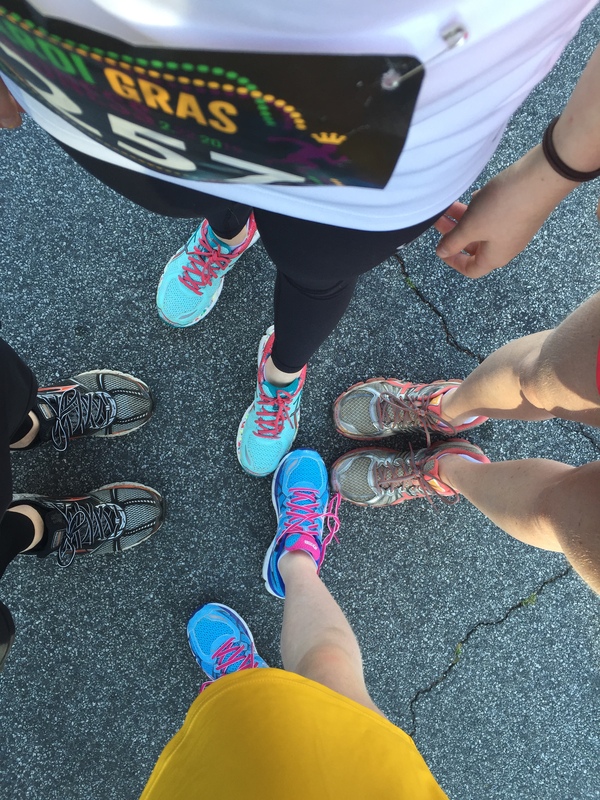 The Mardi Gras Madness 5k is a well-organized, small, local event that has a small town, happy crowd feel. There were around 150 folks at the race, and no-one was looking too fast or competitive at the start line. I ran with my youngest daughter Rosie, who’s nearly 11, and let her set the pace. My wife Selina took off with the leaders, and my eldest daughter Lucy ran in the middle of the pack. 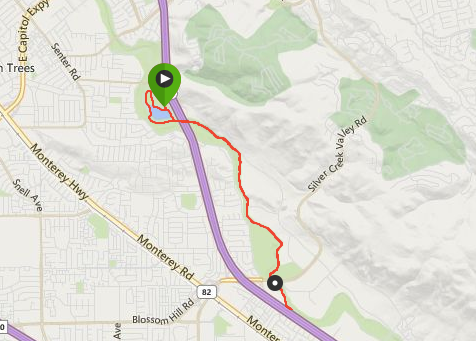 I ran a 27:05, and enjoyed the streetscape, parks, and ambling along in the middle of the pack. Selina won the women’s and was fourth overall. The girls did great, running with the family is pretty special. Cool t-shirt, nice medal, and a good time had by all. See you next week for race #8. It’s been an amazing week. I’m blessed to have so many friends and colleagues supporting my fundraiser for the GBS/CIDP Foundation. As of this morning, we’re at $5,124 raised on our way to the $52,000 goal. Please like my Facebook page at http://facebook.com/fiftytwofives, and donate over at IndieGoGo. 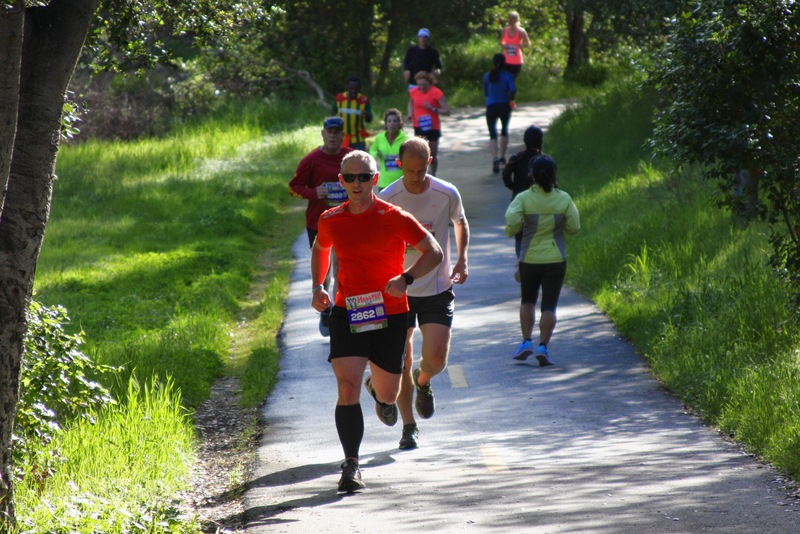 This morning I ran the UjENA Fit Club Double 5k race in San Jose. 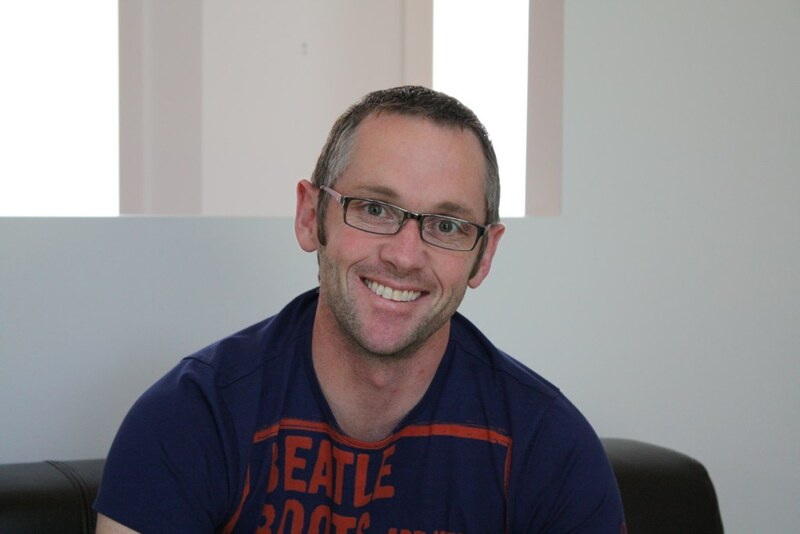 It’s a new concept in running: run part of the race, take a “half time” break, and run the rest of the race. In the case of this 5k, it’s a 3k race, an hour break, and a 2k race. You sum the times from both races to get your overall time. 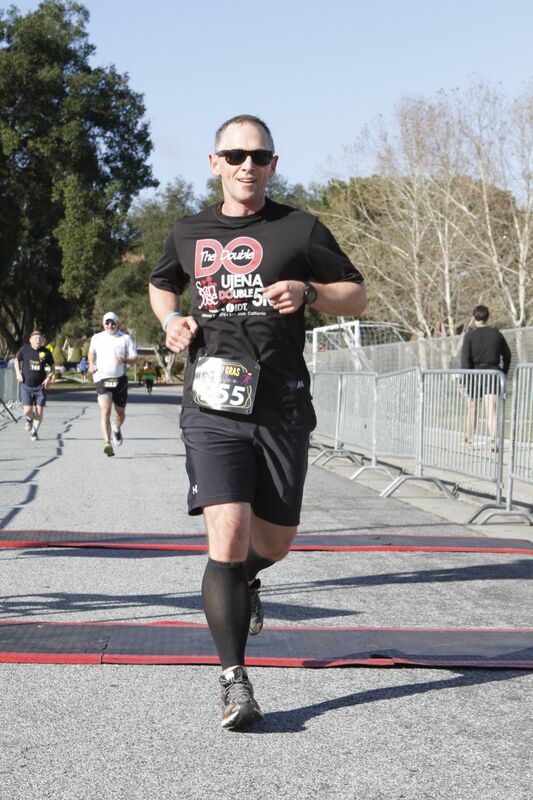 I ran the Double 15k race last year at the same location. Afterwards I decided this wasn’t the greatest new concept in road racing. It’s tough to stop running for an hour and start again: the legs seize up and you don’t feel great on the second leg. It’s boring to stand around for an hour waiting for something to happen. Throw in that it was badly organized, and it didn’t make for a fun day. I mean, what’s the point? So, why run it again? 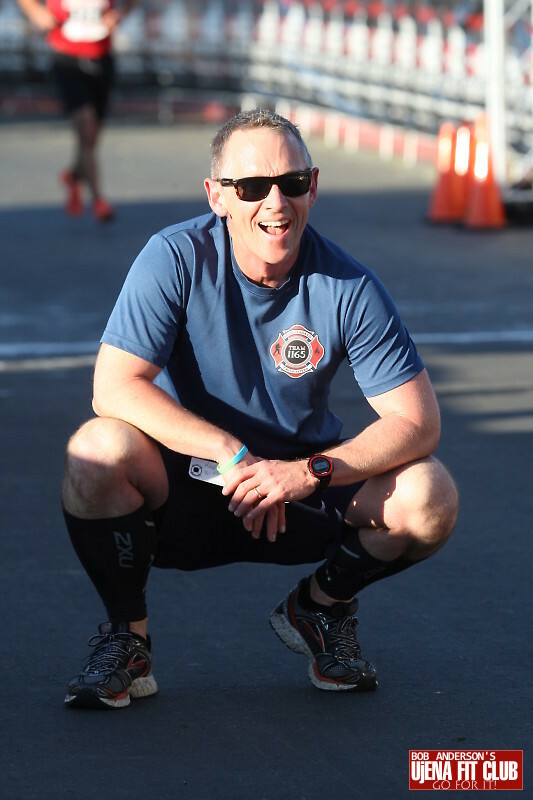 Well, I promised if we raised $5,000 by midnight last night, I’d run two races this weekend. And there wasn’t any other nearby race to run. So, Double 5k it was. The good news was I cranked it out. I ran the first 3k in 11:58 and the second 2k in 8:16. They gave me a 20:15 for the 5k total. By far the fastest I’ve run 5k since I started racing or timing myself. I don’t know whether it really counts — having a one hour break makes it rather non-standard. On the one hand, you could argue taking a rest break is an unfair advantage. On the other hand, you could argue it’s a handicap and I would have gone faster without it. Who knows. In any case, it’s the fastest I’ve run a Double 5k (and, er, the only time). Got a slight calf tweak in the last quarter mile. Another good indication that it’s not a great idea to have a “half time” in a running race. 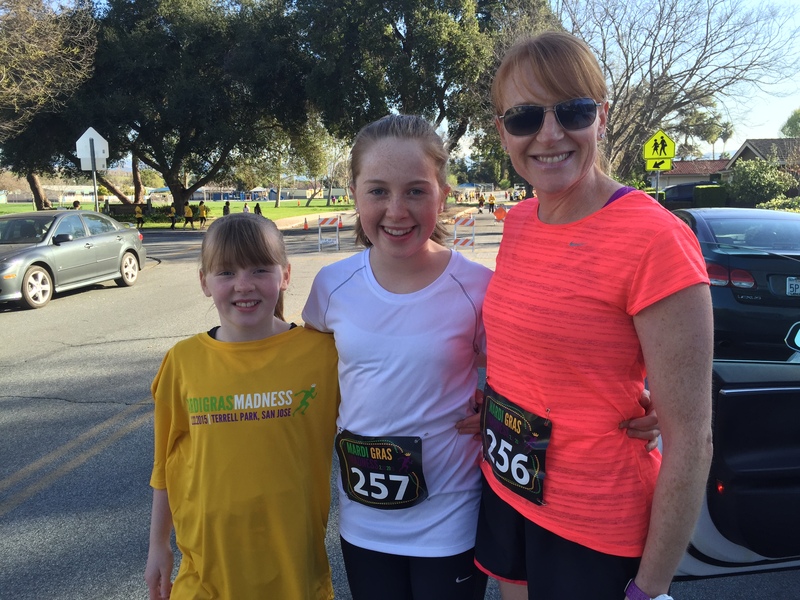 Hopefully, I’ll be ok for the race tomorrow — the whole family is running with me in the Mardi Gras Madness 5k in San Jose. See you then. 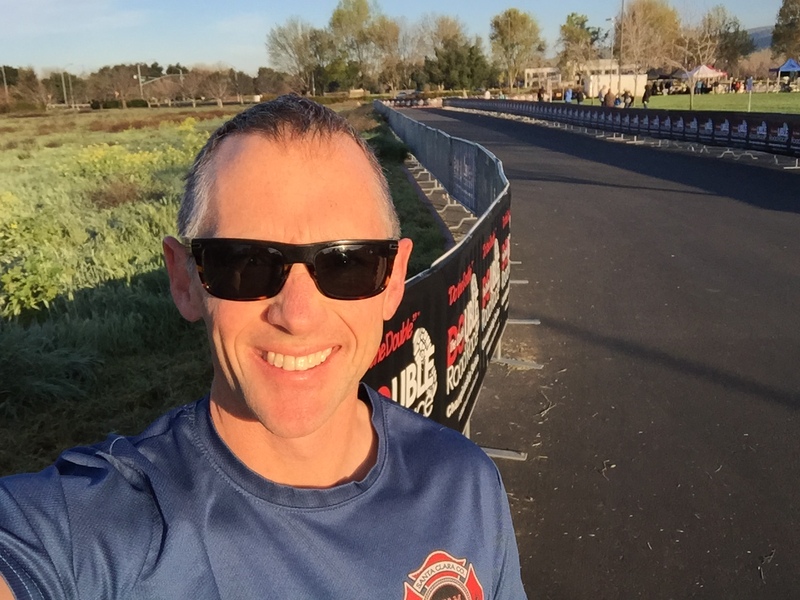 Running the Bay Breeze 5k. 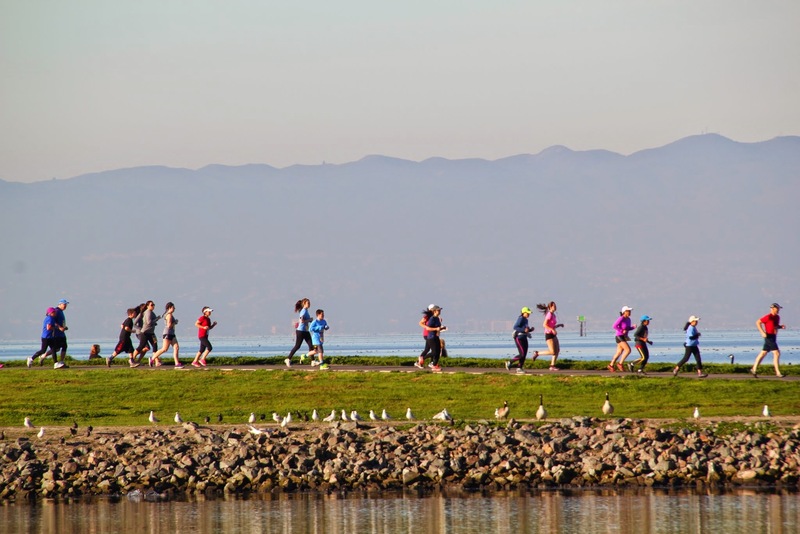 A gorgeous day for a race in San Leandro, right on the San Fran Bay. I ran race 1 in 21 minutes, 32 seconds. Race 2 in 21:21. Race 3 in 21:06. For a 5’9″ guy who’s 45 and who has legs like tree trunks, I’m moving. Kind of like the NASCAR truck series. Oh sorry. Anyway, I ran 31 minutes, 37 seconds. About 10 minutes slower than the first four races of the year. 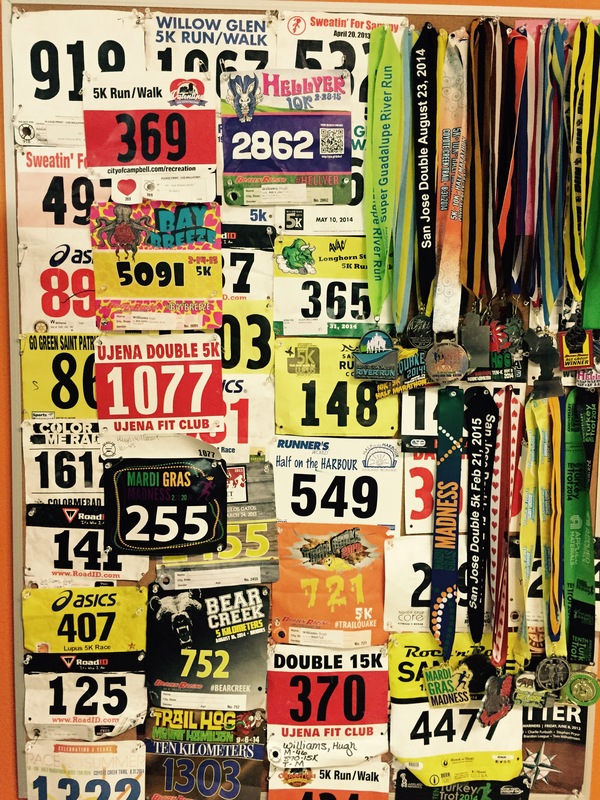 I wasn’t actually supposed to be running — the doctor said no strenuous exercise for a week. I had surgery on Monday — so it was more of a shuffle than a run. I recommend it — running slow, not surgery — it’s nice to smell the roses, look around at the beautiful Bay Area, chat while you run, and have no pressure to get faster. Don’t tell my doctor. I’ll be faster next week. Crossing the finish line in a blistering time of 31 minutes and change. 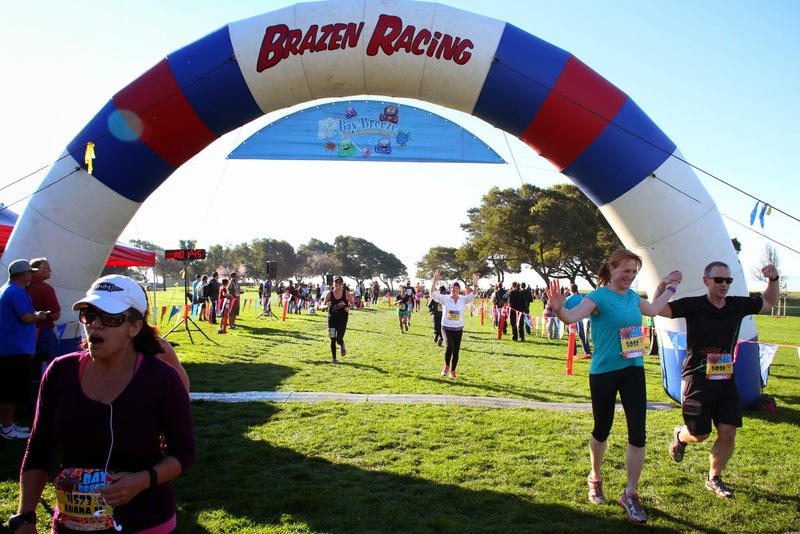 The race was one of the Brazen Racing series. These guys put on a great show — packet pickup is fast, the races start on time, the courses are marked carefully, they take *free* photos, they have the best medals in the business, and the food afterwards is amazing. Most of their races are hard, in state parks on trails, and with climbs that burn your legs. This race wasn’t like that, it’s probably their flattest and fastest, and their most urban and accessible to everyone. Throw in Valentines Day, and you get a crowd of thousands running the 5k, 10k, and Half Marathon. Several amazing people donated to my campaign this week. Thank you to (in order of donation): Nate Lyman, Luis Gaitan (best limo service in the Bay Area), Prathibha Alam, Jay Weiler, Katy Chu, Antoine El Daher, Mike Mathieson, Angela Lau, Oliver Hurst-Hiller, Brian Johnson, Wilson Pang, Gene Cook, and Matt Madrigal. You guys are amazing. Please donate — help people who are debilitated by GBS and its related conditions. It’s a great cause. See you next time.